We've raised our hands for each Donovan Bixley book that's appeared on the press release list and so have built up quite a collection of his iconic work. My girls immediately recognise his illustration style and appreciate his interest in including kiwiana in his work. Esky just came up behind me and said, "Hey, it's Donovan Bixley," seeing this post. The latest two board books are my favourites in the collection so far. Taking known songs and adding NZ-style illustrations was pretty cool (there's no doubt he's incredibly talented), but these latest books are something I really value having on our shelves. They're bilingual! Wahoo! Māori and English words are in clear print beneath each Bixley-esque illustration (many are stars from his books, for existing fans). 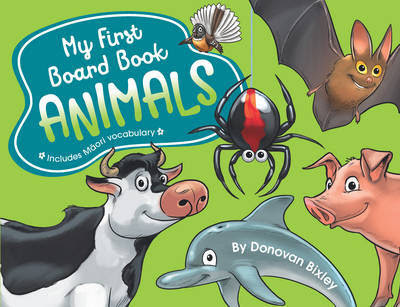 The board book format is not only durable, I find it nice to hold and aesthetically appealling. The bright colours and simple backgrounds are also great for me. 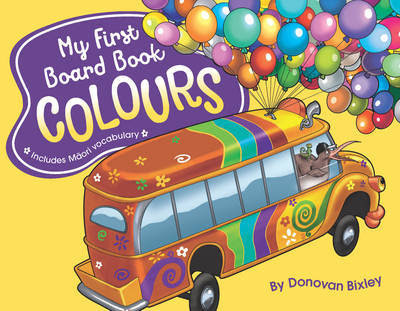 My favourite thing about the colours book is that *the* Māori colours song has been used! AH! It is so great! Because the words comes in the order of a well-loved childhood tune, it is more fun to read and easier to teach / promote retention. Plus there's some colours additional to the song to expand existing vocabulary. With the animal book, I love that there's a kiwi focus on the fauna! Bats?! YUS! And like his other books, the soprano melody is provided in musical notation. It's a nice touch. Out in bookstores today and available on Book Depository from tomorrow. Even though all of our girls take a lot of care with paper pages, I'm thrilled to add these bright and strong books to our home library and think they'd make excellent gifts.